No two Sydney Theatre Company rehearsal rooms are ever exactly the same. They are defined as much by personalities as they are by structures and schedules. One of the usually unsung roles in the room is that of Assistant Director. On Macbeth, that role is held by Melbourne-based director, writer and actor Petra Kalive. Here, she opens the door to the Macbeth rehearsal room to give us a quick taste of what it's like. As I write, I'm sitting in the rehearsal room and the actors are on break. We are halfway through week four and this incredible play is still revealing its secrets, posing challenges and making everyone work very hard. But as I have been watching, I've been thinking about the privilege of assistant directing. 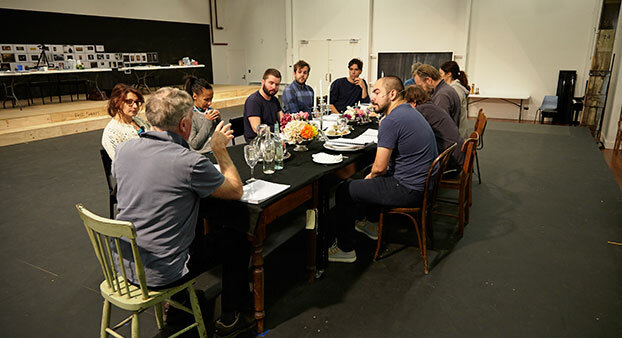 To be able to sit in on another director's rehearsals, to watch them work, watch them sort out problems, to make suggestions (if you're lucky and have a director who is open to that). Actors get to watch each other work all the time and so much is learnt from watching fellow artists and reflecting on their practice and ways of coming at things. It is no different with directing, we just get to watch each other less often. So, what is this rehearsal room like I hear you ask? Well, Kip Williams is an open and generous director, but he is also very softly spoken - so the room has a quiet, throbbing intensity. He is incredibly detailed, very precise and each moment is thoroughly interrogated. It's very exciting to be a part of and, if I'm completely honest, combined with a creative team par excellence, a little intimidating. Especially in my first week - I don't think I said two sentences. Not only is the configuration of the theatre literally reversing the order of things, this play will literally appear a phantasmagoria - and we won't be entirely sure how we arrived there - and as quickly as it appears it will be gone again and we will be left with Macbeth exposed, alone and completely detached. The magic of this production exists in its staging - how did I only just figure that out?